At Capital Fence our full Line of Steel Fencing gives a residence the elegant look of wrought-iron fencing without the expensive maintenance demanded by traditional wrought-iron. Available in Residential, Commercial or Industrial Grade, Steel fences are popular with homeowners, business owners and developers for its maintenance free coating and durable steel construction. 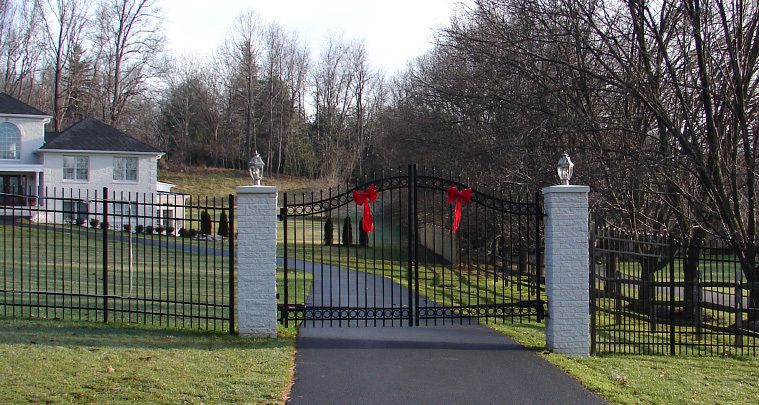 Many prefer an ornamental steel fence over aluminum fencing for the additional strength that a steel fence provides. Our Steel fencing has an powder coated, maintenance-free finish and a 20 year warranty. The welded metal fence panel of has the ability to follow the steepest of grades, that is, to be installed along a slope without unsightly “stair stepping” of the fence panels. Steel Fencing comes in numerous heights, styles and colors. We also offer many options such as rings, finials, post caps & latches. Capital Fence chooses to work with Ameristar Fence for the majority of our steel fencing. Ameristar, which is proudly made in the USA, has provided quality Ornamental Products for over 25 years with an excellent reputation for providing a strong, long lasting product.